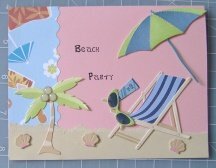 Need some homemade card ideas that are super quick and easy but still come out looking cute and fabulous? The solution is simple. Use ready-made materials, such as stickers, pre-made embellishments, rub-ons, and more. With all of these easy options all you need is a blank card and you are set to go. 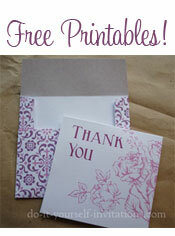 You can even simply print out one of our free printable invitations or blank invitation templates and go from there! Stickers - Yes a practical use for stickers, finally. And I thought they were for my 4 your old to randomly stick to the hardwood floors, counters, and dining room set. Lol!! Seriously though, stickers are a great excuse to get your children involved in your invitation and cardmaking activities. Kids LOVE stickers and will delight in helping you decorate every little card or invitation with an adorned little piece of art. You can pair it with some nice paper, or even a rubber stamp. No reason the sticker couldn't even stand on it's own on a simple white card. Embellishments - Yes a pretty broad term, but in the scrapbooking/cardmaking/paper crafts world this term is slightly specific. Embellishments are like stickers but more complex in design. They are sometimes made with cardboard, chipboard, felt, fabric, you name it. They are also a lot of times much more 3 dimensional. And much more elaborate than simple stickers. Rub-ons - Rub ons are like stickers but more permanent in nature. They are made of a very thin material in which you literally rub them onto surfaces. Anything from paper, to glass, to plastic and metal. You place them face down on your intended surface and then use a tool (a popsicle stick will suffice) to rub them onto the surface and off of the paper in which they are affixed. Bling - Rhinestones, pearls, beads and more! Check any craft store scrapbooking or paper crafts sections and you will find these kinds of items meant just for embellishing your paper crafts. Even buttons! A lot of the time these items will already have bits of sticky glue on the back so that all you have to do is stick them onto your invitations. A very cute and easy homemade card idea is to simply dot the "i"'s on your card (if there are any) with a cute little rhinestone or pearl. A very nice touch. Border Tape - much like stickers, border tape simply sticks right onto your invitation paper. It is essentially tape that has a printed image on it. You can find it with many patterns and even themes adorned to it.